FoodMeter: Good Food or Bad Food? 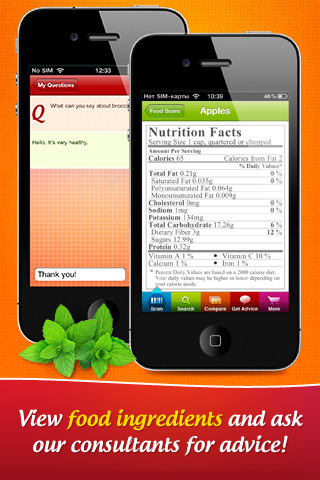 is an app that measures the calories and other nutritional information in food products. It was developed by ARAWELLA CORPORATION for an iPhone, iPod Touch, and iPad. It costs $0.99 or you can get the lite version for free. For those of you out there who count calories or do not feel comfortable consuming anything without consulting the Nutrition Facts you may want to give FoodMeter a try. This app contains information about over 300,000 food items you can find in a grocery store and as well as orders you can place in over 300 restaurants. You can either use the barcode scanner or you can enter in the type of food that you want to know about and you get a rating and the nutritional information pertaining to it. The ratings come with suggestions that either read something like, “you have made a reasonable food choice,” or “this food is rather unhealthy, however, it can be consumed in limited quantities.” The latter statement was made about a Big Mac. To elaborate, a Big Mac has 29g of fat and 1040mg of sodium in it, so I am not sure it should even be consumed in limited quantities if you are a person trying to stay healthy or loose weight. More options offered with FoodMeter a memory bank of all of the food that you have searched and when you searched as well as an Advice section offered by the FoodMeter experts. A gripe I have with FoodMeter is that it often freezes. It is definitely a glitch because my experience was that the average loading time was over a minute for basic functions. I feel it is imperative to fix a problem like this because the surest way to loose interest in an app is when while waiting for it to load you have already moved onto the next thing. 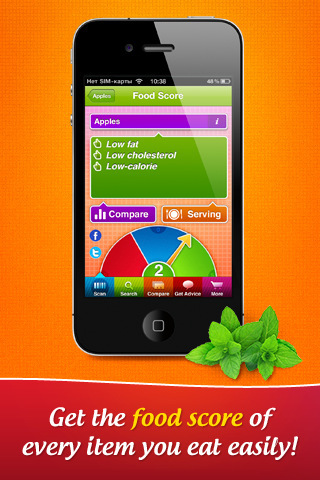 FoodMeter, if nothing else, can get you the nutrition facts that you are seeking. It may take a good amount of your time while you wait for it to load, but if you are persistent you will be able to find out if you can afford to eat that donut you have been eyeing. AppSafari review of Food Scanner: Good Food or Bad Food? was written by Vanessa Paszterko on December 12th, 2010 and categorized under App Store, Food, Health, iPad apps, Reference, Universal. Page viewed 5108 times, 1 so far today. Need help on using these apps? Please read the Help Page.